Walt Disney was always looking for other opportunities to help keep his studio solvent and find additional work for his artists. One solution was supplying short animated segments for other movie studios. For instance, in the 20th Century Fox musical comedy starring actress Janet Gaynor, Servant's Entrance (1934), she is menaced, during a roughly five-minute dream sequence, by kitchen utensils who put her on trial for her mistreatment of them. It included animation from the Disney Studio by Art Babbitt, Roy Williams, Woolie Reitherman, Jack Kinney and many other animators who would become legendary. Even Pinto Colvig, the voice of Goofy, supplies a voice for one of the animated characters. In MGM's Hollywood Party (1934), a black and white segment with Mickey Mouse interacting with live-action comedian Jimmy Durante introduces a Technicolor cartoon called The Hot Chocolate Soldiers that was reminiscent of the Silly Symphony series of the time. Mickey Mouse was largely animated by Fred Moore. However, Walt produced an animated segment for another feature film that was completed but never included in the final release of the picture. 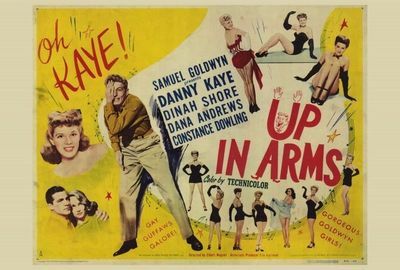 Up in Arms (1944), produced by Samuel Goldwyn and released through RKO, marked the motion picture feature debut of Broadway and nightclub comedian Danny Kaye. The film was both a critical and a box-office hit, earning $3.3 million, and sparked Kaye's movie career. Kaye played the part of Danny Weems, a hopeless hypochondriac who finds himself drafted into the army during World War II and shipped to a remote South Pacific island. The comic and romantic misadventures during the movie are just a loose framework to showcase Kaye's famous rapid-patter songs and natural comedic charm. Unexpectedly, at the end of the film he becomes a hero by capturing a patrol of Japanese soldiers who are hiding on the island by dressing up and pretending to be their commander. The ending seems abrupt and even a little out of character for Weems, who never previously demonstrated any heroism. There is also off screen narration to help audiences understand what is going on in the illogical story. The reason for the confused ending may be because up until its release, that ending would have included an animation/live-action sequence produced by Walt Disney Studios and animated by the legendary Ub Iwerks. As early as 1936, producer Samuel Goldwyn wanted to do a film about storyteller Hans Christian Andersen. By 1941, he had discussions with Walt Disney about producing animated segments of Andersen's famous stories (including one of The Little Mermaid) to include with the live action. The project fell through, although Goldwyn later produced a similar film with Kaye as Andersen in 1952, but featured no animation. "In the time of my grandparents, children were thrilled and chilled by Grimm's fairy tales, and grim they were and fairy tales they were also. The elders of the time certainly threw up their hands in horror at the violence of Grimm. "Today, Walt Disney is heralded as one of the great storytellers of our time—which, indeed, he is. But what do we see with a Walt Disney film? We see horror and violence, after which good triumphs over evil. My daughter Dena had nightmares for a whole year after she saw Snow White and the Seven Dwarfs. "I hold that neither Grimm nor Disney are the culminating factors in the definition of a child's personality. I think we would throw neither rocks nor puffs at them, but accept the fact that Grimm existed in his time and Disney does very well in our time." The completed animation for Up In Arms was finished in black-and-white and ready for the final step of being done in color and combining it with the live action, but at the last minute Goldwyn decided not to use it as he continued to make changes to the film. For instance, humorist Pete Smith had recorded the narration for the film, but Goldwyn then had it re-recorded by Knox Manning. In the case of the finale, Goldwyn felt the audience would feel cheated if they didn't see Kaye fighting the enemy on a cliff cave, because the action in the original ending was obscured by strange, comical, animated insects called Weavie-weavies literally eating the film away as it was being projected. In an excited voice, the narrator would have described the great battle, but the audience could only see only bits and pieces as the creatures kept eating away the images. Goldwyn filmed a brief new ending where Kaye's character disguised as a general who leads the enemy soldiers into a pit. When Kaye trips the third soldier into his trap and he disappears, he lets out the famous Disney echoing "Goofy Holler" of "Wahoooey!" The script describes the Weavie-weavies as "animated caterpillar worms with almost human faces who appear from everywhere and start chewing holes in the film. As they eat chunks out of the film, we hear a sound like rabbits noisily chewing carrots." Poster of Up in Arms starring Danny Kaye. They were to be a parody of the voracious appetite of Japanese silk worms who as larvae continuously eat mulberry leaves. In the September 17, 1943 issue of the trade newspaper The Hollywood Reporter, it was announced that Disney was going to supply the animation for the sequence. An agreement had been made earlier on August 24, 1943 for Disney to do the work. The Hollywood Reporter blurb stated, "Samuel Goldwyn and Walt Disney announced yesterday that the Disney organization will do an animated sequence for Up In Arms. The sequence is already in work and will be presented as part of the climax of the film. "They suspended work on their jointly proposed feature The Life of Hans Christian Andersen at the outbreak of the war, so that Disney could devote more of his time to production of films identified with the war effort and international relations. It is still on the Goldwyn-Disney agenda to be completed after the war." An urban myth was that the Disney animation in the film would have featured the notorious gremlins popular during wartime that Walt had announced he was going to use in a feature film for RKO to distribute. That assumption is untrue. By March 1943, Walt had cancelled the plans to make the feature and, by August 1943, had cancelled all plans to make an animated short subject with the gremlins as well. In addition, Walt had to answer to writer Roald Dahl and the Royal Air Force, who only wanted the gremlins used in reference to aircraft and, more particularly British aircraft, so would have been inappropriate for use in the Goldwyn film taking place in the South Pacific. In November 1942, producer Cecil B. DeMille announced he was going to incorporate gremlins into a war related film he was developing but that never happened either. Scene 2: Would be close up of rope described above paragraph. (Japanese soldier) suspended from rope. Weavie-weavie eats through film from reverse side and in large bites eats towards rope. We cut the scene when the Weavie-weavie has eaten practically through the rope. Shown by sketches 2 and 3. Scene 3: Same setup as Scene 1. Approximately one foot after the start of scene, (Japanese soldier) who was suspended by rope falls from scene. Shown by sketch No. 4. This Weavie-weavie disappears back of film. Another Weavie-weavie eats cliff out from bottom of field as per sketch No. 5. Weavie-weavie eats toward center as bottom Weavie-weavie eats head and sword of (Japanese soldier). Weavie-weavies continue eating around and part of action towards upper right hand corner. Weavie-weavies tug of war over last remaining bit of film. Film snaps. One Weavie-weavie bounces off bottom portion of film and through hole that was previously eaten in film, screaming as he falls off stage. Remaining Weavie-weavie looks down and offstage as he hears long scream or yell. Shown by sketches No. 6 through No. 12. Scene 4: Close up of Weavie-weavie as he turns towards audience and goes through dialogue: "Now you'll never know what happened! I'm the only one who knows and I'll never tell! Never, never, never!" Cut. Shown by drawings No. 14 and 15. The memo continued: "We do not wish to be held to the exact letter as we will probably take certain liberties with this proposed draft. We are proceeding with this outline. If they object, we suggest they get in touch with us immediately as we are trying to move the production as fast as possible at their request." Both Ub Iwerks and animator George Nicholas, who was working on the Pluto shorts, were copied on this information. Iwerks later directed the sequence and did most of the animation. The following year Iwerks would develop a process for combining live-action and animation for The Three Caballeros. On Friday September 10, 1943, Avalon Productions delivered to the Disney Studios prints of the live action from Up In Arms and viewed the animation test that was met with approval. The Disney Studios then moved the scene through to a final production with some minor changes of its own. It was determined that the delivery date for the final work would be October 11, 1943, roughly three weeks later. On October 21, 1943, Disney Studio lawyer Gunther Lessing wrote to reaffirm a phone conversation that giving Disney credit for the cartoon sequence was optional to the company even though it had been required in the original agreement. Scott McQueen, former senior manager of film restoration for the Disney Company, used to travel around the country with a program of Disney film rarities that he had unearthed titled "Disney's Unseen Treasures." He did the presentation at the Disney Institute on January 25, 1997, which is where I saw it and talked with McQueen after the show. In the presentation, he included the segment he had found from the Up In Arms film. There was live-action color footage of Kaye doing hand-to-hand combat with the Japanese soldiers outside a cave on the side of the mountain with black-and-white animation layered over the top where the little creatures (who had several hands/legs, two antenna and a point on the end of their bodies like a stinger) poke into the picture and literally eat up the screen including a rope hanging down on the left side of the mountain causing a soldier who was hanging on to fall to his doom. The final image has of one of these little caterpillars finishing off a final bite and then looking at and talking extensively to the audience in a close-up. He ends with a huge laugh and then belches loudly and wiggles off the screen. The inside of his mouth is painted a bright red but there was no other color on the creature. McQueen could not locate the dialog script or the sound track for the segment. The face of the Weavie-weavies is very reminiscent of 1930s Disney characters like Bucky Bug. At first the narrator blames the disintegrating film perhaps on a type of mildew indigenous to tropical climates but then offers the explanation that it is perhaps an unusual South Seas pest known as "Weavie-weavies". During the battle, the script has the narrator panicking: "Ooooooh! I'm sorry folks. It's those Weavie-weavies again! Can't seem to keep them off the film! Get off of there, you worms! Folks, if you look carefully you can still see some of the fight going on!" So locked in its vaults, Disney has the completed animation for the segment, but not the final Technicolor version which was probably not finished. As an independent producer, Goldwyn had been fighting against theater chain monopolies that were operated by the big studios and offered smaller rental fees to independents. The theater chain owner in Reno, Nevada, offered Goldwyn a flat film rental fee for Up In Arms. Goldwyn responded by converting the El Patio ballroom outside the city into a makeshift theater at his own expense and pledged to donate the opening night box-office to the local chapter of the Red Cross. Goldwyn was a member of the Society of Motion Picture Producers (SIMPP) along with Mary Pickford and Walt Disney. Pickford showed up opening night to give a speech in support of Goldwyn and all independent producers. She read a letter written by Walt Disney who also supported the situation. The publicity drew national attention. However, there was one more encounter between Disney and Goldwyn. Some readers may be familiar with the Samuel Goldwyn film with Danny Kaye titled A Song Is Born (1948), which was a remake of the Gary Cooper/Barbara Stanwyck screwball comedy Ball of Fire (1941). Both films were directed by Howard Hawks and produced by Goldwyn. Goldwyn originally wanted the film to be a sort of live action version of Disney's Snow White and the Seven Dwarfs. Basically, the storyline is seven quirky bachelor music professors (plus the Cooper/Kaye character who is supposed to be the prince who rescues the damsel in distress) working on an encyclopedia of music who have their comfortable lives invaded by a hard-edged female who is hiding out from the authorities and is the girlfriend of a wanted gangster. She introduces them to popular music since their expertise is just classical music. For Ball of Fire, the publicity department staged a portrait of the seven actors playing the professors seated in front of a poster for Snow White and the Seven Dwarfs, with each in the same position as the dwarf he represented: S.Z. Sakall – Dopey; Leonid Kinskey – Sneezy; Richard Haydn – Bashful; Henry Travers – Sleepy; Aubrey Mather – Happy; Tully Marshall – Grumpy; and Oskar Homolka – Doc. "It actually was Snow White and the Seven Dwarfs – with the striptease dancer as Snow White," said Hawks in the book Who the Devil Made It: Conversations With Legendary Film Directors by Peter Bogdanovich. For A Song Is Born, Goldwyn went so far as to correspond with Disney to get permission to use the "Heigh Ho" song from the Disney film. Disney denied permission and other direct references to the Seven Dwarfs were eliminated as a host of uncredited writers tried to rework the original screenplay.